Some Blue Pikmin constructing a bridge at the Wistful Wild. Bridges are common obstacles in the Pikmin series. Naturally, their purpose is to help cross a gap, often a body of water. Pikmin are tasked with building the bridge, which cannot be crossed until it is completed. Their appearance and building method depends on the game. In Pikmin and Pikmin 2, bridges are found as a pile of wood on one side of the gap, which Pikmin can be set to work on. Doing so will cause them to construct the wood into a bridge that goes over the obstruction. Sloped bridges may also be found near a ledge and provide a ramp up/down the ledge once built. When being worked on, the bridge grows in chunks at intervals, marked with a cloud of dust. Cloaking Burrow-nits and members of the Mandiblard family chew apart stick bridges and progressively roll them back into piles. To note is that in the second game, bridges will only take the usual time to build if it is the first time the player is on the area. If the player goes to the area again on a later day, or simply goes inside a cave and comes back out, the bridge construction progresses from one checkpoint to the next instantly, with the only delay being the time it takes for the clouds to dissipate and for the Pikmin to move to the next pile. 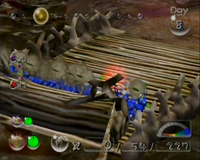 Also in this game, if a Pikmin attacking a bridge is pushed to either side of the pile, it can cling on to the bridge and attack that way, instead of striking whilst standing up. If this happens, it will attack more frequently than usual, allowing bridges to be built faster. In Pikmin 2, there is one bridge that is surrounded by poison, just like some gates. Naturally, only White Pikmin can approach it, but once a few segments have been built, the poison pipes may be destroyed, allowing other Pikmin to assist them in completing the bridge. A number of glitches are associated with these bridges, generally involving Pikmin or enemies getting stuck in or under them. A fully-built red bridge in Pikmin 3. In Pikmin 3 and Hey! Pikmin, bridges are made of fragments of various objects, rather than wood, as in the previous games. These fragments are mostly of ceramic objects, but can also be shards from objects such as glasses. Bridges are made from varying numbers of fragments (in Pikmin 3, the shortest is 30, and the longest is 84), and come in several different colors, with some bridges already being partially or fully completed by the time they're encountered. Depending on the bridge, it may or may not be possible to throw Pikmin and leaders from the bridge (an example where it doesn't work is the light blue bridge leading to the Winged Onion in Pikmin 3). To build a bridge, Pikmin must carry fragments over to it, which they then put into place. Once all fragments are delivered, the bridge is completed. Because these bridges are made of a hard material, enemies cannot destroy them as they can wooden bridges. In Pikmin 3, unfinished bridges are slightly slanted upwards, and an invisible wall will prevent leaders from crossing past the last existing row of six fragments. In addition, a bridge lowers into place when it is completed, which can knock leaders over if they are standing too close. Leaders on the bridge itself will not be knocked down. Fragments explained in a data file. Fragments are tiles of broken household objects that are used to build the bridges in Pikmin 3 and Hey! Pikmin. Fragments are clustered together in piles, and the Pikmin will carry them to the bridge of the corresponding fragment color. Each bridge can have one or more piles of fragments. Fragments are also occasionally buried in dirt mounds or encased inside crystals. Additionally, in one case, in the Garden of Hope, fragments are used to build an overturned plant pot, not a bridge. When it is finished, it is used as a platform to throw leaders and Pikmin across. It's worth noting that even though Winged Pikmin can't reach submerged fragments of the pot, they can still build it underwater by carrying non-submerged fragments over and tossing them to where they belong. Because each bridge has its own color, fragments from one color cannot be used to build a bridge of a different one. Many of the fragments actually come from nearby broken pots, cups, glasses, and other modern-day objects. In Pikmin 3, Pikmin will run back to the pile of fragments they were assigned to and take another piece. They will even return if there aren't any fragments left. However, if a Pikmin carrying a fragment is called back, that fragment will vanish and reappear at the pile it came from. Pikmin carrying fragments can also be pushed in this game, making them go faster. Each bridge is made out of a certain number of fragments (brown bridges are made of 30, red and blue of 60, and light blue of 84). Fragments are placed in rows of six, and any given row must be completed before the next row may be started – this is most noticeable when a large group of Pikmin carrying fragments arrives at the same time. Hay is an obstacle in Pikmin 3 that essentially replaces the sloped bridges from the previous games. While bridges are made out of fragments, and link two pieces of land over a gap, hay is grabbed in chunks and piled up against walls to serve as a ramp to go up. A large and tidy pile of hay sits in one place, and Pikmin grab chunks off of it, one by one, like fragments. When they reach the wall that needs to be overcome (which can be recognized with some faint strands of hay on the floor), they toss their hay on the floor, so that it piles up. When it's done, the "task complete" sound plays, and Pikmin and leaders can use the new ramp to climb up the wall. These chunks act just like fragments otherwise. The two bridges at The Distant Spring that face one another, fully built. A bridge in the Awakening Wood being furled back up due to some mandiblards. The cyan bridge in the Twilight River, fully built. A blue bridge being built. A yellow bridge, nearly complete. A pile of red fragments. A pile of fragments, hidden away. Fragments being released from a dirt mound. Cyan fragments encased in a crystal. Red fragments being taken to their bridge. A pile of china fragments. The completed china pot in the Garden of Hope. A bundle of hay with 30 parts. Pikmin building a blue-fragmented bridge an early version of Pikmin 3. The first bridge in the game, made out of red flower pot fragments. A long, half-built blue bridge. A partially built glass bridge. Fragments of a white bridge scattered about. Portuguese (NoE) Ponte Bridge Translation taken from the Pikmin instruction manual. This article was a featured article from August 1st, 2018 to October 1st, 2018. This page was last edited on January 13, 2019, at 01:13.